Located in the southwest medina quarter, the Koutoubia Mosque is the largest mosque in Marrakech. This mosque is most famous for its minaret towers. 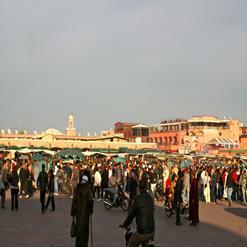 The minaret rises 252 feet high and is a symbol of Marrakech. The mosque is ornamented with a band of ceramic inlay, curved windows, decorative arches and pointed merlons. The Koutoubia Mosque served as a model for many buildings such as the Hassan Tower of Rabat and Giralda of Seville.